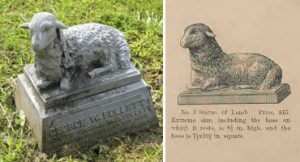 The catalogue provided the consumer an opportunity to create personalized monuments with elements and forms that best represented both their aesthetic tastes and personal attributes. You could select what you wanted in a memorial and customize the design much the way you furnish a room or build a house. 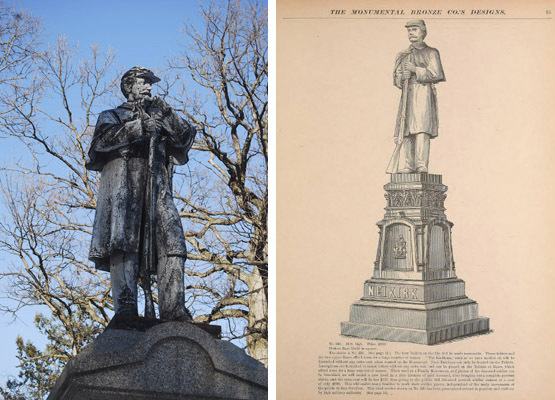 Monumental Bronze offered many iconographical emblems and statues that could be combined, mixed and matched and added to a large selection of “blank” bases; pedestals, obelisks, columns, to create a memorial. It gave the salesman the printed examples with price lists to offer customers. 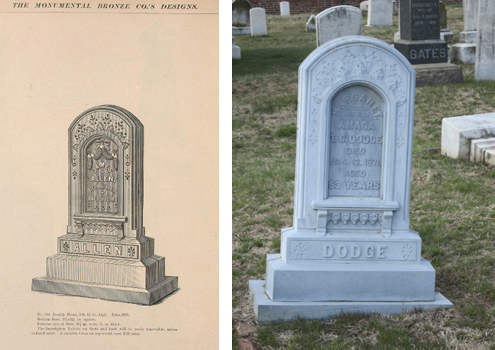 In the case of this company based in Bridgeport, CT, casting samples of over 2,000 monument designs and ornaments for showrooms across the country would have been wildly impractical- hence the catalog. Rotundo, Barbara. 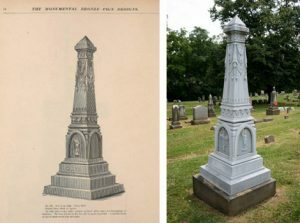 Monumental Bronze: A Representative American Company, in Cemeteries and gravemarkers : voices of American culture / / edited by Richard E. Meyer. Publisher: Ann Arbor, Mich. : UMI Research Press, c1989.